Pioneers in the industry, we offer ftir hydraulic press, 15 ton manual hydraulic laboratory presses, ftir press dies, hydraulic press, kbr dry box and hydraulic laboratory presses from India. Hydraulic Press, We are counted amongst reckoned names in the industry, committed towards offering a wide gamut of Hydraulic Press for FTIR. This press is used by R & D & QC labs for various pelletizing applications for IR/XRF etc. At our sound production unit, the offered press is manufactured using supreme grade components and contemporary techniques in compliance with defined industry norms. Furthermore, we provide this press in diverse specifications to fulfill the needs of our patrons. 15 ton laboratory Hydraulic Pellet Press is a compact, elegant and robust machine, typically used by R & D & QC labs for various pelletizing applications for IR/XRF etc. The high pressure pumping unit supplies hydraulic fluid to the up- stroking ram of the cylinder. This causes the ram to rise steadily and positively in the upward direction. As a result, pressure is applied on any object placed between screw and piston top plate. Most commonly used Die for IR/FTIR for solid sampling of 13 mm pallet size consist of Anvil & Plunger, Top & Bottom Die Port, Extractor Ring, O-ring. Agate, Motor Pestle use to proper sample. The cell holder is used to mount circular as well as rectangular windows & it can be used as Demountable Cell & Fixed Thickness Cell using different spacers supplied along with ptfe washers of different sizes. 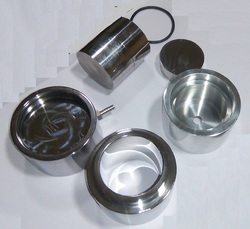 Mull Cell holder is used to mount circular window & for mull samples. 15 Ton Manual Hydraulic Pres, To meet variegated demands of our esteemed clients, we are engaged in offering an exclusive range of 15 Ton Manual Hydraulic Press. The offered press is used in mechanical industry. For manufacturing this press, our skilled professionals use only high quality components and cutting-edge techniques as per the defined industry quality standards. 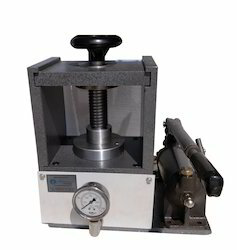 In addition to this, we also modify this press according to the varied requirement of our clients. Cylinder Type : Single acting, upstroking. Pump Type : Hand operated. Platen Size : 100 mm (Die will be placed on this platen). Overall Weight : 50 Kgs. Overall Dimensions : 300 (L) X 270 (D) X 425 (H) mm. Safety Feature : Pressure Relief Valve to safeguard against applying over-pressure. FTIR Accessories KBR Die Set 13mm DIE SET 13mm PALLET PRESS DIE Die Set. Making use of quality assured raw material and ultra-modern methodology, the offered set is manufactured by our qualified professionals with utmost care and perfection. To ensure its quality, our quality controllers examine the entire range against numerous measures of quality. Additionally, we provide this set in different specifications to fulfill the variegated need of patrons. 15 Ton Manual Hydraulic Press, A complete Laboratory hydraulic press producing a force about 15 tones use to make high quality 13 mm Pallet used for IR/FTIR/XRF Solid Sampling 15 ton laboratory Hydraulic Pellet Press is a compact, elegant and robust machine, typically used by R&D & QC labs for various pelletizing applications for IR/XRF etc. The high pressure pumping unit supplies hydraulic fluid to the up stroking ram of the cylinder. This causes the ram to rise steadily and positively in the upward direction. As a result, pressure is applied on. Usable Volume 450 x 250 x 150 mm. 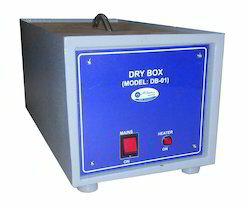 With our rich industry experience in this domain we are edicatedly engaged in offering Dry Box. The provided dry box is carefully manufactured by our skillful workforce using well tested components and progressive technology keeping in mind the set norms of industry. Also, this dry box undergoes several tests by our quality auditors in order to deliver a defect free range. 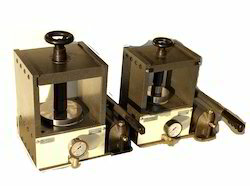 We offers a range of manual, power, and automatic hydraulic presses for a variety of laboratory press applications. Our hydraulic press products include: KBr pellet presses, XRF pellet presses, and thin film making press accessories. 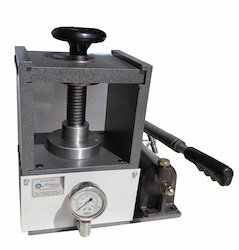 All laboratory hydraulic presses are bench-top mounted, and are compatible with a broad selection of Specac hydraulic pellet press dies and heated platens. The pallet holder is use to hold pallet (13 mm) of KBR, suitable to any IR/FTIR Agate, Motor Pestle use to proper sample Hand pellet press and die products are available for routine laboratory FTIR KBr pellet press sample preparation. These pellet press and pellet die sets are designed to be easy to use and give consistently high-quality KBr pellets for FTIR spectroscopic analysis. Heated platen and thin film making accessories for Specac hydraulic presses. These are designed for the fabrication of thin films of polymer materials for FTIR transmission spectroscopy. Standard and high-temperature thin film making kits are available. Daylight : 90 mm * Cylinder Type : Single acting, upstroking. 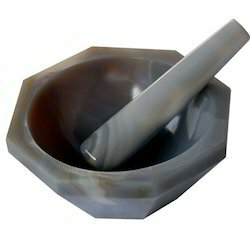 We are one of the most revered exporter and supplier of an impeccable assortment of Agate Mortar and Pestle-2"/4"/6"/8". Our provided product is tested on several parameters so as to make certain its defect free range. This product is precisely developed by using premium quality components and sophisticated technology in adherence with the set standards of industry. Customers can avail this product from us at competitive price. 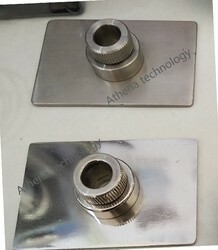 Pellet Holders to suit the above sizes are manufactured by us, the standard being 13 mm Aluminum Anodized Pellet Holder. These are regularly supplied by us along with the above Accessories. Looking for FTIR-IR XRF Accessories ?